The trend of late at cakelava HQ has been GRAND. 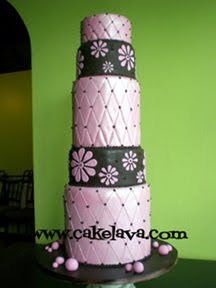 Larger guest counts, taller cakes, and more artistically involved designs. In the past 2 weekends, we've made two 5-tier wedding cakes, both around 3 feet tall, and both all Real Cake. Why would you want it any other way? We typically don't include the "dummies" in our cakes, because we want the cake to be served and enjoyed. At Saturday night's pink and brown themed wedding for Teri and Robert, we were asked by one of the hotel staff, "which tiers are fake?" "None", we said, "All is to be served". We thought it a little odd that the assumption is that some tiers are fake, when pretty much the only time we'll use "dummy" tiers in our cake is for a press shoot. Teri and Robert's cake was a towering beauty in person. Their beautiful pink and chocolate brown cake perfectly matched the decor in the room. 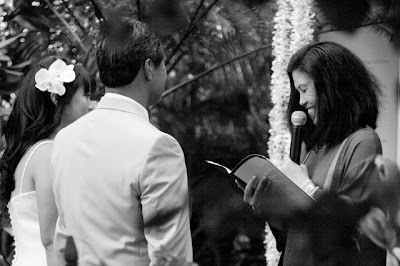 They were so smitten by it, that the groom came up to us while we were in the room and told us how much he loved it. It did definitely get a reaction from everyone who saw it, and knowing it was well appreciated meant we could finish our night off with a smile. Congratulations to Teri and Robert! The tables have turned. 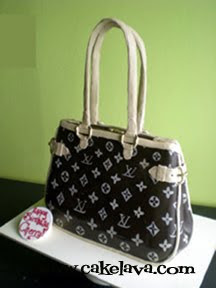 When we first started making the Louis Vuitton purses, it was almost always women who inquired about them. See our previous post, the "Louis Vuitton Pavlovian Response" It makes sense. Few men would dare try and select a woman's handbag or shoes if they know what is good for them. However, an interesting phenomenon has occurred and our male clients are getting braver. 8 out of 10 calls we now receive for women's purses come from the men, and they all want their Louis'. Rick recently asked "why is it always Louis? There are so many other purses out there." He was asking this because the time involved in making these purses is higher than the non-monogrammed ones. They are handpainted with precision, front and back. I explained to him that women want the Louis. Yes, they want the Prada and the Chanel and the ... , but they always want the Louis. It means something to them. They've "arrived", or maybe are closer to arriving than before they owned a Louis. Rick was working on another Louis shortly before I started this blog. Another husband wanting to surprise his wife with her favorite purse. He is very sweet and terribly excited about presenting his wife with her special cake. The newest Louis is different than Cherry's Louis, which is shown above. Cherry's Louis was also ordered for her by a man. He let Rick choose whatever style he wanted as long as it had the monogram. This one had buckles on the side, and I loved it as much as all the others he's made. Come back next week to see some of our newest wedding and birthday cakes. 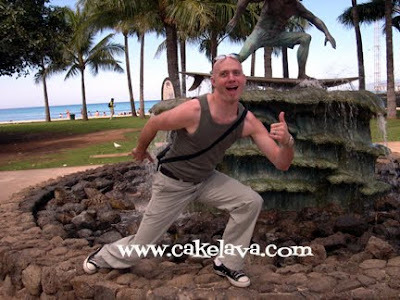 In the meantime, check out cakelava.com or join us on twitter. Today's blog is dedicated to Rick Reichart, my Super Awesome, Amazingly Talented, perpetual goofball yet unbelievably sweet husband who is celebrating his birthday today. Rick, like any dedicated business owner is spending the majority of his birthday working as he usually does, and he's doing it without any complaints. Our calendar is booked this weekend so he's cake-ing away as he intermittently answers Birthday phone calls. I've had the privelege of owning a business and working with Rick for four and a half years, and am continually in awe of the level of dedication he has, to his family and friends, and to his art. Rick regularly puts in 60-70 hour work weeks and is constantly thinking about how he can make the best cake possible, even if it means he doesn't get a day off that week, or can't participate in one of our social invitations. All of his efforts haven't gone unnoticed. In addition to regular magazine features, he's had to turn down the Food Network Challenge multiple times to compete because of his commitments to clients, and he was approached by a couple national television shows in the past year. Though he's flattered by the attention, the cakes, not the limelight, is his love, and as long as people are happy with his cakes, and we can take a vacation every once in a while, that is enough to keep him content. Happy Birthday Rick! You are an inspiration to me and many others, and I wish you the best birthday ever! I hope you get everything you wish for when you blow out those candles! 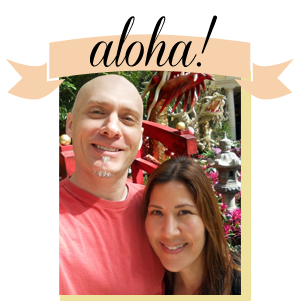 Yesterday, after reading our blog, Rick suggested that we keep to the military theme and share some of our favorite military Ohana photos collected over the years. 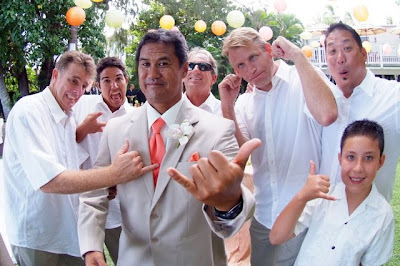 In Hawaiian Ohana means family, or in this case, our family/community of clients. 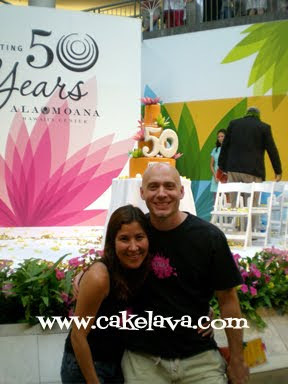 Shortly after we opened cakelava, we started an Ohana album, also Rick's suggestion, and I thought it was a great one because it allowed us to share the photos that our clients had sent us. 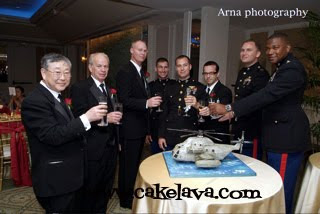 We have selected a number of Ohana shots with our clients in their ceremonial military uniform. For us, it's a lovely walk down memory lane. We hope you enjoy them! 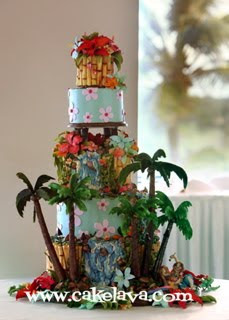 Jill and Carl (shown above) and their Kauai-inspired wedding cake, with palm trees, waterfalls, and lush tropical flowers and bamboo. Their wedding cake was designed by Rick in 2006. 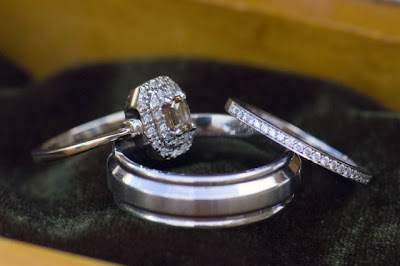 All pieces are handcrafted and there are custom figures of the bride and groom sitting by a fire pit on the right side. All images are courtesy of Mark Nomura Photography. Carly and Matt are one of those completely adorable couples, who recently celebrated their 1-year anniversary. 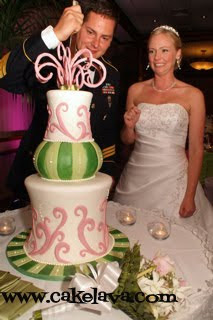 Carly and Matt, a previously Featured Wedding couple on cakelava.com, had a pink and green color palette for their wedding and wanted an unusual cake, a little funky and a little bit elegant, and this cake fit the bill. Images courtesy of Dave Miyamoto & Company. Although they started their cake cutting by playing it safe, they decided to go another route. Love that expression! Christie and Patton also just celebrated their 1-year anniversary this month. 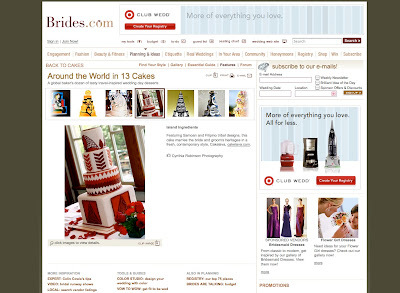 Their wedding has been featured on cakelava.com as well as YWD (Your Wedding Day) Magazine. 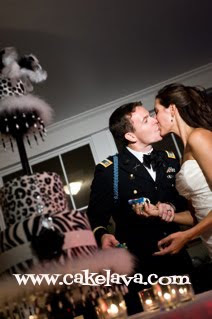 Christie and Patton are super SWEET and absolutely Loved their black and white animal print, Rainbowlicious flavored wedding cake. Images courtesy of VISIONARI. the sword makes for a perfect cake cutting tool. A kiss and a piece of Rainbowlicious in hand. 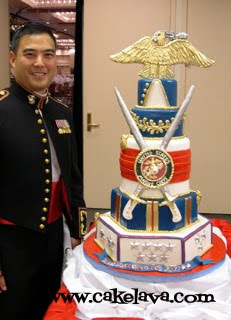 Rick designed this cake for a Marine Corps Officers' Ball. One of the Lt. Colonel's standing proud and guarding the cake. 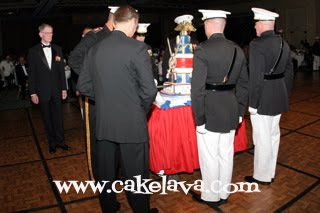 The cake was a huge hit at the Ball and we were hired the following year for the same event. The cake during the traditonal cutting with the military sword by the General. Nina and Matt were married in 2007 and had a pretty extravagant wedding with a 6-tier wedding cake with handcrafted flowers and a CH-53 Delta helicopter groom's cake. Matt's birthday cake on cakelava.com has appeared recently on AOL's "Bizarre Birthday Cakes" and was the sculpted bottle of Palmolive. He's a clean freak and enjoys washing dishes! Images courtesy of Arna Photography. Love the formality of this shot! Thank you to everyone who has graciously sent us their images to share. We salute you! 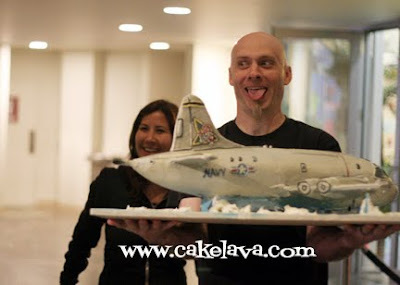 visit cakelava.com to see more military cakes. When we first met our client, she was a Captain in the Army, an impressive title and one to be proud of, but she was even more excited about her promotion to Major and wanted a special cake to celebrate her newest accomplishment. 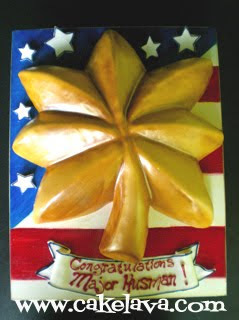 Rick designed her a patriotic cake with a sculpted golden oak leaf, the insignia for Major. 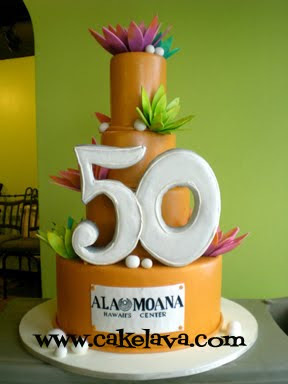 Major Husman chose our Bananarama flavor for her cake. We were proud to be part of a day she will forever remember. Congratulations, Major Husman! 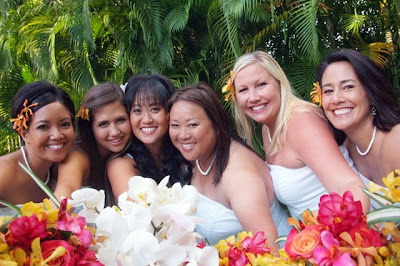 Michelle and Dave's Featured Wedding is now up on cakelava.com. 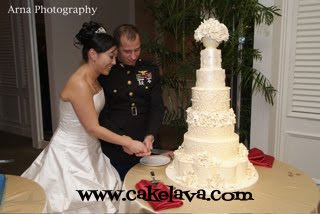 We are both excited and honored to present our next Featured Wedding couple on cakelava.com. Michelle and Dave Miyamoto were married on Saturday, June 20, 2009 at the lovely Bayer Estate in Aina Haina with over 100 of their closest friends and family present. 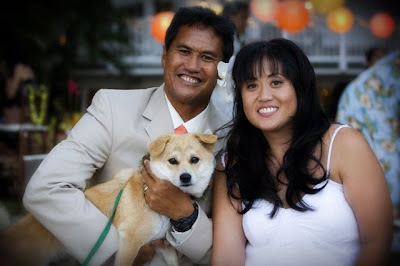 Both Michelle and Dave are well known in the wedding industry in Hawaii. 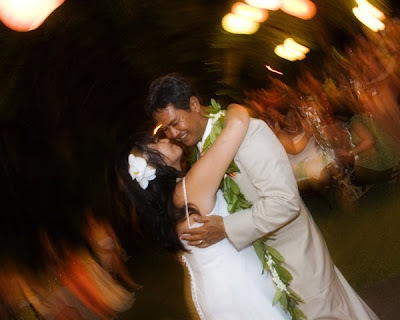 Michelle used to be a wedding coordinator and Dave Miyamoto is an in-demand wedding photographer whose amazing images can be seen locally in Pacific Weddings Magazine and Pacific Edge Magazine. He's also a member of Style Me Pretty's "Little Black Book" which means of course, he's fantastic! 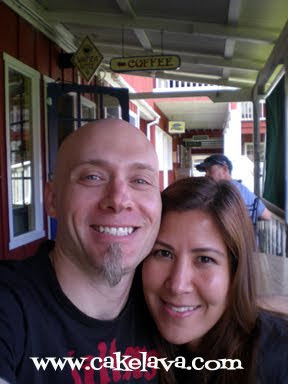 We have been working with Dave regularly since we opened cakelava and we adore him and his work, and his unbelievably sweet wife Michelle. 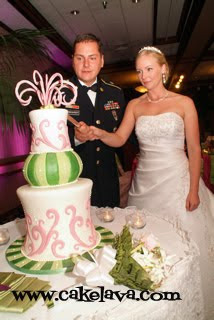 If you follow our blog, you will recognize their wedding cake, shown above. You can read more about their wedding cake in a previous post, The Magical Miyamoto Matrimony. 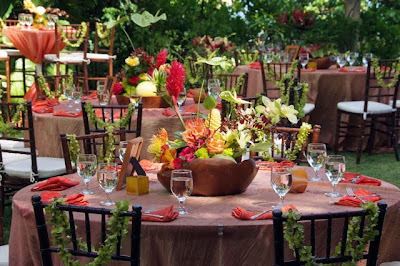 What you haven't seen is the beautiful wedding, which was created by some of Oahu's finest: Photographers Geralyn from Hokuli'i Images and Russ Ramos of Russ Ramos Photography and Dave Miyamoto & Company, floral designer Debbie Hemingway of Designs by Hemingway, Ginniberries for catering, Susan O'Donnell of Aloha Wedding Planners , The Bayer Estate, and cakelava. Their wedding was special in so many ways. From the inclusion of the family members during the ceremony and performing in the reception, to the beautiful decor arranged by floral designer Debbie Hemingway, it was an unforgettable event! 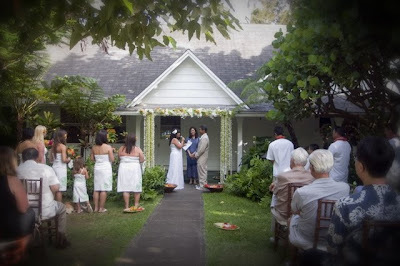 A BIG Mahalo to Dave and his beautiful wife Michelle, for including us in their wedding and having us present at one of the most touching weddings we have ever attended! 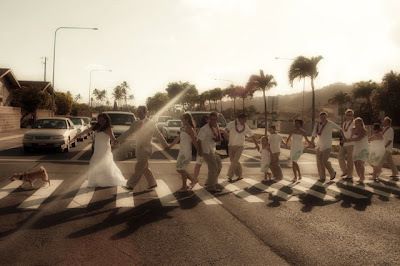 Dave, Michelle and their wedding party doing Abbey Road as they head to the Bayer Estate. 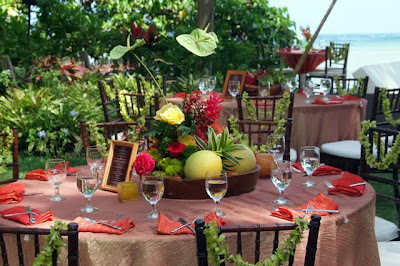 Debbie Hemingway of Designs by Hemingway did a fabulous job creating lush, tropical tables. 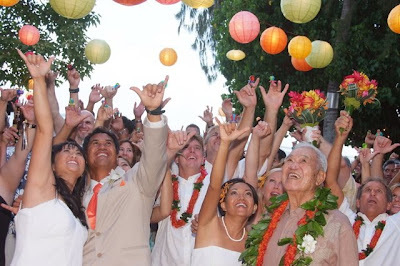 just a few friends showing off their candy rings in honor of the couple. We're in the middle of the photo. 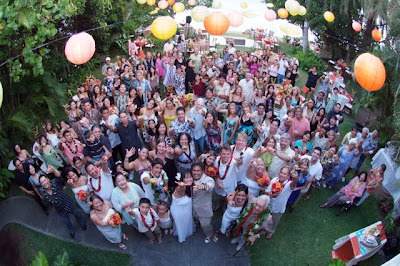 Geralyn Camarillo of Hokuli'i Images in the front row next to Dave and Michelle. Three of the sweetest people you will ever meet! 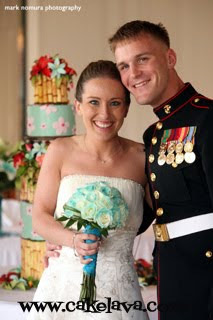 Visit cakelava.com in the next couple days to see Michelle and Dave's Featured Wedding! 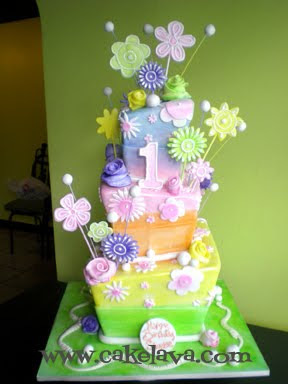 For Saydee's birthday party on Saturday, Rick designed a colorful, fun and whimsical flowers cake. The cake was done in cheerful pastels with accents of white. We took inspiration from our "Jessie" design which the client loved, as well as photos of the centerpieces which had cute flowers on sticks. The cake tiers were sharp-edged and tilted, giving the cake sophistication in a playful way. When the cake was delivered to the site, everything in the room matched in color and theme. There were plenty of "oohs" and "ahhs" when the guests saw the cake, and Saydee's mother called us shortly after to say how much everyone enjoyed the cake. Happy Birthday Saydee! It's that time again. Another Featured Wedding! 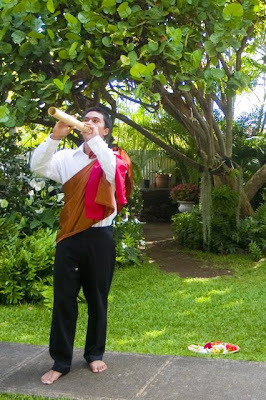 Join us tomorrow to sneak a peek at our next Featured Wedding on cakelava.com. 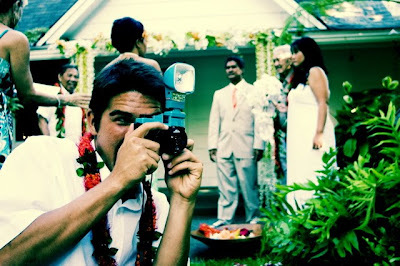 We're showcasing Hawaii wedding photographer Dave Miyamoto and his lovely bride Michelle's wedding. You won't want to miss this beautiful affair! 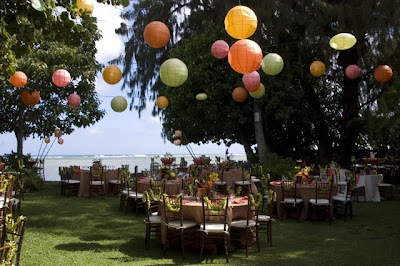 We love the idea of travelling the world via cake and enjoy bringing in different cultural elements into our designs. 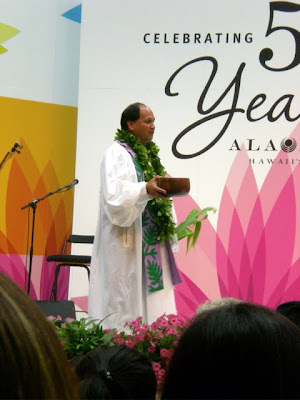 Over the years, we have had the opportunity to "travel" to Spain, Greece, China, Samoa, Japan, Morocco, and of course, Hawaii, and with each visit, we have the opportunity to learn more about the traditions and culture of the place. 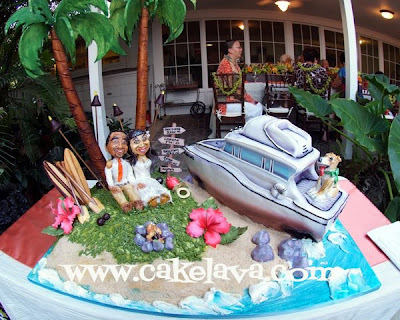 We were very excited when Brides.com, the companion site to BRIDES magazine, requested images of cakes inspired by a destination or culture, and even more excited when we found out 3 of them were selected in the feature called "Around the World in 13 Cakes", 2 representing Hawaii and one of Samoa and the Phillipines. Our ocean and beach themed "Seaside Sweets" cake feature is also currently up on Brides.com. Congratulations to our couples whose cakes were showcased on Brides.com and to our talented photographers, Hawaii residents Stefanie and Annie Riedel of Absolutely Loved and Cynthia Robinson Photography, who is based in San Francisco and who we had the pleasure to work with. 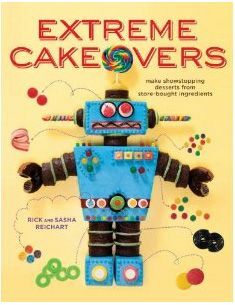 There are some beautiful and unusual cakes to view in the feature and we encourage you to check it out. No passport or boarding pass required. Enjoy! More coming soon. Aloha, til next time! Football Cake - For the Son or the Daddy? 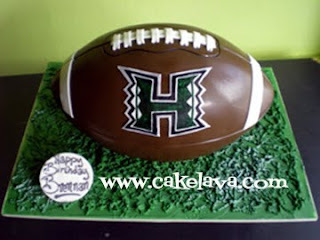 When we took the order for the sculpted football cake with University of Hawaii logo several months ago, we noted the cake was for a birthday party for a couple's son Brennan. We wondered if the child, Brennan, was named after Colt Brennan, who used to play for the Hawaii Warriors. It was a plausible guess, but we'll never know for sure. The father of the child picked up his cake at our studio shortly before we had to leave for another event and for a brief time, we almost forgot that the cake was for his son. He was so enamored of the cake and we wondered if he would allow anyone to cut and serve the cake or if it would just be stared at in admiration by the football fans in the room. Touchdown! Happy Birthday Brennan! More cakes to come soon. Aloha, til next time! 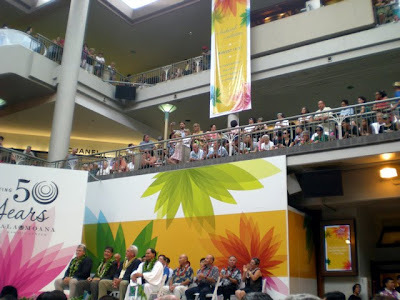 Happy Birthday, Ala Moana Center! Wow, what a fun night that was! 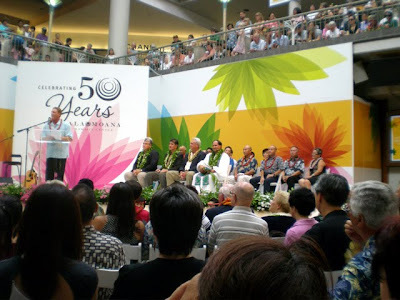 Last night we helped one of our favorite shopping destinations in the world, Ala Moana Center, celebrate its 50th Birthday in a grand celebration held at Centerstage. 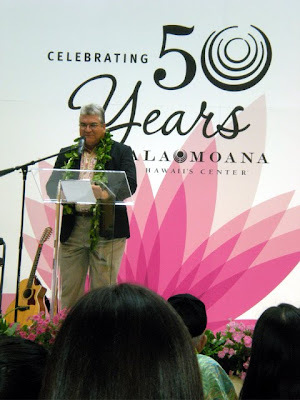 Emceeing the event was KHNL (NBC) news anchor Howard Dashefsky who led us through a spectacular program which included introducing Francis Cofran, the General Manager of Ala Moana Center who acknowledged the 11 original tenants still with the shopping center after 50 years. Mayor Mufi Hannemann was supposed to attend but couldn't and sent words of birthday wishes to the center. 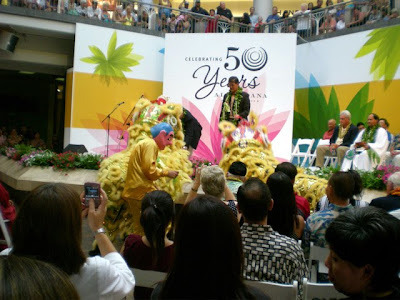 A traditional hawaiian blessing kicked off the performances from the Taiko drummers, a Chinese Lion Dance and a rare treat, getting to hear the famous Hawaiian band, the Brothers Cazimero live, who sang "Happy Birthday" to Ala Moana as our cake was wheeled out onstage. Anyone who lives on Oahu knew how humid it was yesterday. Yesterday, like Wednesday was very humid and it's always a concern for a cake to be out in the humidity, especially when it is all real cake inside, as ours was. The cake held up beautifully all the way to the end when it was presented and the candles blown out. 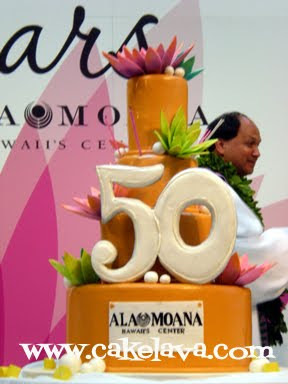 Rick worked with Ala Moana Center to design a cake that would match the colors and brightly colored flowers used at the event. Orange was a striking and appropriate choice. The cake was extremely heavy to transport and quite tall. 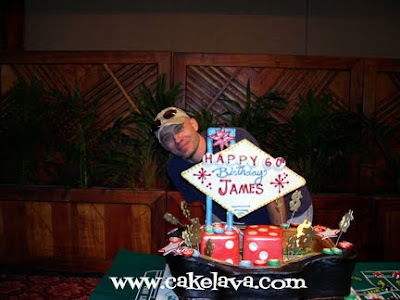 Everything on the cake was handcrafted and the logo handpainted. 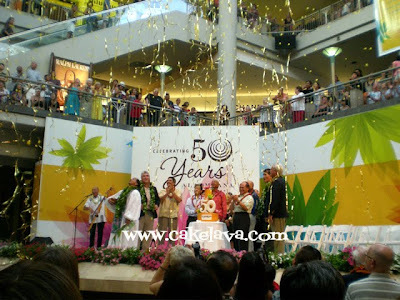 VIP guests got to enjoy the Guava Lava flavored cake after the celebration at a private event. 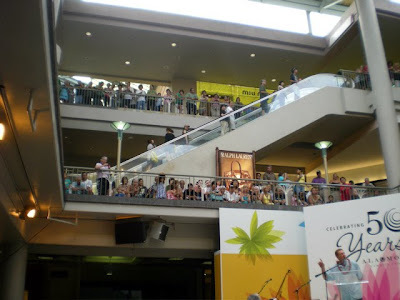 We opted not to stand in the mile-long line for the "golden" tickets in the chocolate bars and instead supported the mall by having dinner at one of their restaurants with some friends of ours who came down to enjoy the event. 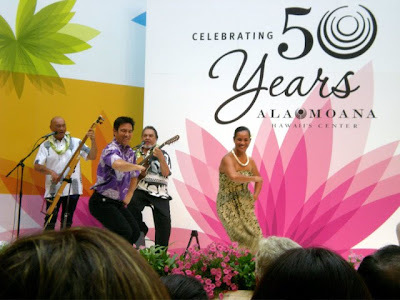 Happy 50th Birthday, Ala Moana! Here's to the next 50 years!!! Here are some photos taken last night. We had prime seats and a perfect vantage point to capture it all. 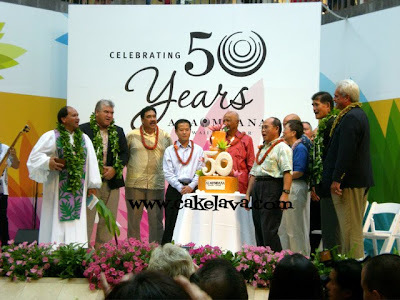 All four of the local news last night featured the event along with the cake and it got a sweet photo in today's Honolulu Advertiser newspaper. 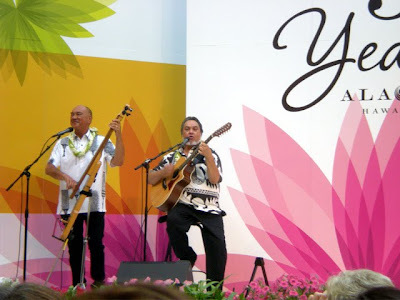 To see a short video from the event, visit the Honolulu Advertiser's site. Enjoy! 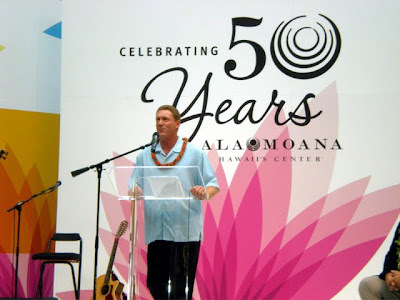 Emcee news anchor Howard Dashefsky. They don't call him "Dash" for nothing. 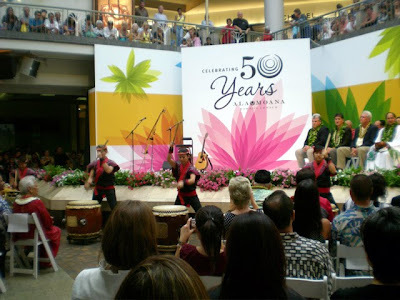 Taiko drummers -- what energy! the lovely Jasmine carefully wheeling out the cake. It looked perfect! the end of the celebration! the cake held up beautifully! the designer, Rick Reichart, and me (Sasha) happy after the celebration! Alas, the fun comes to an end, but there are more celebrations to look forward to this weekend. Can't wait!